Religion can do many things for people. Some turn to religion to find meaning and purpose. Others look to escape the harsh realities of life. That’s good because most religions offer ways to find meaning, and techniques designed to distract us from the daily grind. But I don’t follow Jesus to to find myself or to anesthetize myself from pain. I follow Jesus because he offers me God’s love. Even though I don’t deserve that love, he gives it anyway. As a grateful recipient of God’s grace and Jesus’ love, I can truly say that I have been not just changed, but I’ve been transformed. Nothing in my life has touched me so deeply, or changed me so completely, as God’s grace given through Jesus Christ. That’s why I follow Jesus. What about you? What motivates your faith? 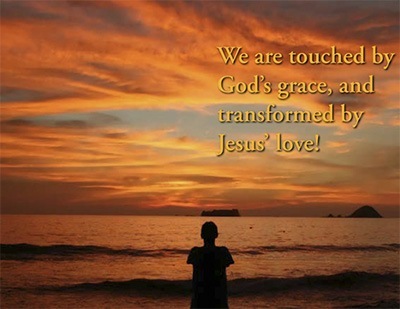 Have you allowed God’s grace to touch you, and Jesus’ love to transform you? There is no greater love and no more abundant grace to be found. Let Jesus touch and transform you today!